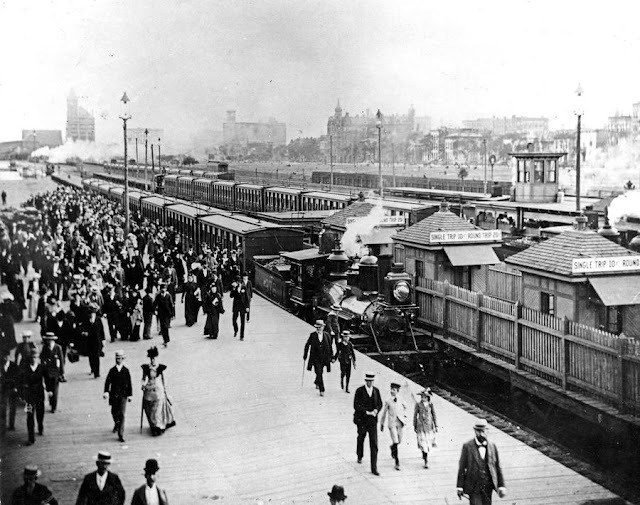 June 25, 1912 – President Charles H. Markham of the Illinois Central Railroad heads for New York with a copy of a new contract between the railroad and the Chicago south park commissioners that is designed to bring about electrification of the line’s suburban service within five years. This is a BIG DEAL for the city. The railroad agrees to remove its Twelfth Street station east of Indiana Avenue, allowing for the widening of Indiana Avenue from Thirteenth to Twelfth Street and providing space for the proposed Field Museum. The I. C. will also provide a 40-foot wide piece of land to the city on the east side of Michigan Avenue south of Twelfth Street so that Michigan Avenue may be widened at that point. The contract states, “. . . that no building of any dimensions whatever, excepting such as may be required for passenger service accommodation and the like, shall be directed or maintained upon any part of the right of way between a line 500 feet north of Twenty-ninth street and Fifty-first street, and that this portion of the right of way shall not be used as a railroad yard, or for the storage of cars, locomotives, or equipment, or be put to any use except for the passage of trains, and that there shall not be erected upon this portion of the right of ways any advertising signs or other obstructions to the view of the adjacent property or lands.” [Chicago Daily Tribune, June 24, 1912] With this understanding in place, another step is taken in providing unobstructed green space along the lake shore. The photo above, taken in 1893, shows the Van Buren Street terminal in what today is Grant Park with the Illinois Central station and office building to the left of the photo in the distance.